Initiative Group Alpbach in Sarajevo organized a Beyond Forum ALPBACH - SARAJEVO World Café, a project under the concept of the World Café, which aims to give students and young people an opportunity to actively participate in the discussion. According to the World Café concept, students are divided in groups, where every group has an 15 minutes opportunity of discussion with each of the participating guest experts. Social entrepreneurship is for sure one of the hottest topics today. What is social entrepreneurship and what makes it different than "regular" entrepreneurship, who are social entrepreneurs, is there any social entrepreneurship in our country?.. These are just some of the questions our guest tried to discuss with student participants at our Spring World Café. 5. Kenan Rešo, general manager at the Federal Employment Bureau. 3. Amila Ramovic, direcor of "Sarajevo Chamber Music Festival"
4. Jasmink Halilovic, author of the book "War Childhood"
5. Valentina Pellizzer executive director at OneWorld - Platform for Southeast Europe (OWPSEE). 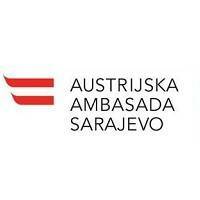 The last Sarajevo World Café in 2012 was held in September with the support from the Embassy of the Republic of Austria in Bosnia and Herzegovina. The main topic of the Café was Our Expectations : Future of Culture and Arts in Bosnia and Herzegovina, where we discussed the future of culture and art in our country, as well as the role of all relevant institutions, such as nongovernmental sector and ministries in charge in the improvement of the current situation in culture and art. The patron of the event was H.E. Donatus Köck, Ambassador of the Republic of Austria in Bosnia and Herzegovina, while the discussion was moderated by Claudia Schmied, PhD. a Minister of Education, Art and Culture of Republic of Austria, Wolfgang Petritsch and Wagner Gottfried. An opportunity to participate and to share their opinion had Haris Čalkić (Association URBAN, Sarajevo), Dobrila Govedarica (Open Society Fund), Petra Bischof (Prohelvetia, Sarajevo), Ena Đozo (Sarajevo Film Festival), Hana Stojić (TRADUKI) and many others. The second Café had a sustainability of Sarajevo the development of the city, as well as the problems that the inhabitants of Sarajevo face daily, as the main topic. Student Parliament of the University in Sarajevo SPUS, School of Economics and Business Sarajevo SEBS, Embassy of the Republic of Austria in Bosnia and Herzegovina, Jordan Studio, Fornetti, RedBull, Vispak.